Carbon monoxide (CO) poisoning is the second-leading cause of poisoning death after drugs. Find out if you’re at risk and how to prevent it. With winter upon us—SafeWise decided to learn more about Carbon Monoxide poisoning patterns across the country. We looked into which states have the highest and lowest death rates, what factors increase your risk, and how you can keep yourself safe. Using CDC data from 1999 through 2016, we were able to identify the top five safest and top five most dangerous states for accidental, non-fire-related CO poisoning-related deaths, as well as regions with the most emergency room and hospital visits. *Please note that population numbers reflect the sum of annual population numbers between 1999-2016 for residents in each state. 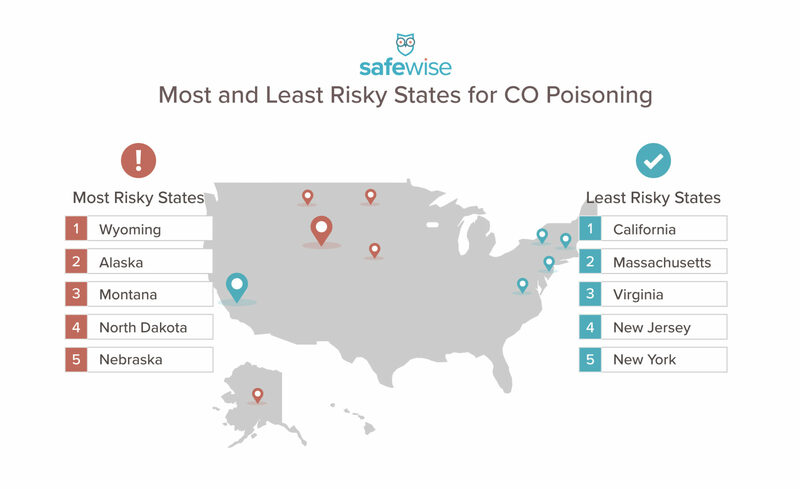 States with a combination of high altitude and northern latitude see more deaths from CO poisoning. And this rings true for the top five most dangerous states. Each one has a mean elevation of 1,900 feet or higher—placing them all in the top 32% of the nation when it comes to elevation. Both Montana and Virginia have no regulations requiring CO detectors, but one state is in our five most dangerous while the other is one of the safest for CO poisoning-related deaths. Even though it’s home to one of the states with the fewest CO Poisoning-related deaths, the southern US sees more CO poisoning incidents (emergency room and hospital visits) than any other region (37%). Three of the states with the fewest CO poisoning-related deaths are in the Northeast. CO poisoning is gender-biased, but not like you’d expect. This one is in favor of women—men are nearly three times more likely to die of CO poisoning than women, representing 71% of victims.. According to a recent SafeWise survey of 5000 Americans, 38% of females were concerned about carbon monoxide poisoning compared to 33% of males. Not surprisingly, CO poisoning deaths are most common in the winter. You can’t blame nor’easters for CO poisonings—the Northeast has the least number of incidents, with just 19% of all poisonings happening in this region. Surprisingly, rural locales are least afflicted with accidental CO poisoning—only 18% of incidents occurred in rural towns (compared to 62% in urban cities and 19% in the ‘burbs). Heating systems are responsible for 34% of all CO accidents. Overall, engine-driven tools (like generators, snow blowers, etc.) are the main source (42%) of non-fire-related CO poisoning in the US. Only 4% of all CO poisonings can be blamed on gas ranges or ovens. 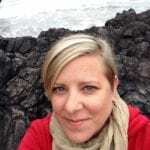 White Americans are the predominant victims of CO poisoning (this is one area where it really doesn’t pay to be a white male). Folks over the age of 45 have the highest incidence of CO poisoning (55%). Only 3% of all CO poisoning cases involve people younger than 15 years old. Only 37% of SafeWise survey respondents ages 35—54 were concerned about carbon monoxide poisoning, even though 42% of carbon monoxide poisoning victims fall within that age group. Nationwide, there is an average of 439 deaths per year from accidental, non-fire-related CO poisoning. Overall, the numbers of deaths due to CO poisoning decreased from 1999 to 2014. In 1999 there were 1,874 total deaths from CO poisoning in the US, compared to 1,245 in 2014. Each year, more than 400 Americans die from unintentional CO poisoning not linked to fires, more than 20,000 visit the emergency room, and more than 4,000 are hospitalized. Poison control centers receive, on average, more than 680 calls per year about CO poisoning. Between 2006 and 2010, fire departments responded to an average of 72,000 CO poisoning incidents each year. Carbon monoxide is odorless and colorless. Carbon monoxide is produced in fumes from cars and trucks, stoves, generators, lanterns, furnaces, and any other item that burns fuel. No one is immune to the dangers of CO poisoning. Because carbon monoxide is an odorless, colorless gas, symptoms can be the only way of recognizing exposure. This increases the danger for people who are exposed during sleep or while under the influence of drugs or alcohol. Many people use flu-like symptoms to describe CO poisoning, as noted below. Give heating systems an annual check-up from a certified technician. Hire a chimney sweep to inspect and clean your chimney once a year. Prohibit use of portable, flameless heaters inside your house. Only buy gas appliances that come with a seal from a national testing agency (like Underwriters Laboratories). Don’t use your gas stove or oven to heat your home. Never use portable gas appliances (like a camp stove) inside the house. Remember that generators are outdoors-only. Keep them outside and at least twenty feet away from all windows, doors, and vents (that includes the garage!). Don’t run your vehicle inside an attached garage—even if the door is open. And always open the door of a detached garage before running your car. Every year thousands of people suffer from accidental CO poisoning—but you don’t have to be one of them. This is one of the most preventable tragedies there is. Regardless of your state’s track record for CO poisoning incidents, there is plenty you can do to minimize (if not eliminate) your chances of falling victim to this covert killer. Know the signs and symptoms, and follow good practices to keep you and yours out of harm’s way. And, for goodness’ sake, run out and get a CO detector if you don’t already have one. SafeWise analyzed CDC data to determine which states in the country had the highest and lowest numbers of CO poisoning-related deaths per 1,000 people. We looked at data from 1999 to 2016 for both accidental carbon monoxide poisoning and accidental poisoning from vapors and gases. To determine final rankings, we considered state laws that require residential CO detectors and local CO poisoning tracking programs. Rhode Island, Washington DC, and Hawaii were not included in the rankings because of unreliable data.